Faraway Press: The Online Home of John Jackson Miller: Star Wars: Lost Tribe of the Sith - The Collected Stories now on sale! 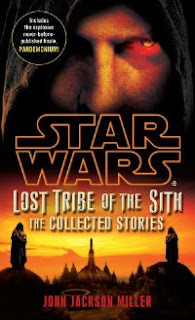 Star Wars: Lost Tribe of the Sith - The Collected Stories now on sale! The spiffy new trade paperback edition can be found at your local bookseller, as well as from Amazon, from Barnes & Noble, from Things from Another World, and from Random House directly. The electronic version can also be downloaded for Kindle or from Barnes & Noble. This edition includes the original eight novelettes released from 2009 to 2012, along with a new novella, "Pandemonium" — which gives you all the prose Lost Tribe stories to date. (The comics series starts two weeks later at Dark Horse.) It also includes my maps of the continents of Keshtah and Alanciar — we're doing the full Tolkien here! The production notes for the "Pandemonium" section will be online later at the main page for the book — once I've heard some of the questions you folks have. Comments welcome in the thread below — and there will be some other opportunities coming up to talk about the book. In the meantime, more news: I did a video interview with Big Shiny Robot that's now online -- that's what's left of me after several days of Comicon! I've also done an interview for the Wisconsin State Journal about the book, and about my upcoming signing at the Mineral Point Road Barnes & Noble, this Saturday at 3 p.m. The Rebel Legion and 501st will be represented!